If you're new to horse riding finding a Riding School should be high up on your list of priorities. 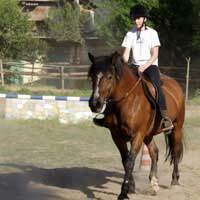 They can provide riding lessons either on an individual or group basis. Finding the right one for your personal requirements can be especially overwhelming, as there are many to choose from. Look for one that has been approved by the British Horse Society (BHS) or the Association of British Riding Schools (ABRS), as both indicate reliable Riding Schools. There are more than nine hundred Riding Schools in the UK, most of which fall under the British Horse Society Approvals Scheme, which is designed to help horse riders find a riding establishment (such as Riding School) that is best suited to what they're looking for. As well as the UK, there are also Riding Schools that have been approved by the British Horse Society in Ireland, Belgium, Spain, the USA, Hong Kong and Singapore. The Association of British Riding Schools (ABRS) also regulate and oversee Riding Schools. All riding establishments that have been approved by the BHS or the ABRS are subject to annual inspections to make sure that they are of a high standard, and must pass a series of standards in safety and horse care to meet this. They also require their riding instructors to have passed exams to qualify for the position, so you can be sure that you're in the hands of someone who knows what they're doing - even if they've only passed the basic level exams. However, if you're going to be stepping up to a more advanced riding level, it's worth looking for instructors with higher qualifications. Visit your preferred Riding School(s) before you commit yourself to booking a riding lesson. It's easy to be swayed by promotional material, but the Riding Schools may not be quite what you expected when you turn up in person. Should I have private lessons? For new riders, private lessons can provide better tuition and support than group lessons, as they are usually on a more personal basis (there are never more than three students in most private lessons). As there are less students for the instructor to attend to, you'll generally find that you'll have the chance to progress quicker than in group lessons. Unfortunately though, this also makes them more expensive. It's worth the investment if you can afford it though. Finding the right Riding School isn't as difficult as it might seem, despite the many choices that are available. Most people choose a Riding School that isn't too far from them (in the same county, at least). Obviously this can leave you a bit restricted in terms of choices, but any Riding School that has been approved by the BHS or the ABRS should be of a suitably high standard. Being approved by either (or both) of these organisations is very credible, and most approved Riding Schools will be keen to highlight this if they've met the required standards. Once you've picked your Riding School, you're ready to book yourself some lessons. Private lessons are preferable if you can afford to pay for them, but group lessons are still a good way to learn horse riding.